← Submitting works to groups is live! Protagonize is a site full of talented authors, so it’s no surprise that we sometimes have to deal with some uncomfortable or suspicious behaviour from unscrupulous users who may be trying to take advantage of some of our younger or more impressionable members. The reason I bring this up is that our moderation team has noticed some odd behaviour from a couple of new accounts on the site in the last day or so, and I thought it would be prudent to make sure you were all aware of potential publishing scams that float around writing sites off-and-on. Brand new users on the site contacting you (and/or others) out of the blue, praising your work effusively or making unbelievable or unlikely claims, then asking for your personal and/or contact information. Anyone claiming to be an official representative of of a publishing firm or company, but not giving you their credentials, or using unprofessional email addresses or linking to web sites they can’t prove they represent. Anyone asking you to send them manuscripts or copies of your work, in full. Please be cautious when dealing with folks you don’t know on the site, and be aware that it’s unlikely that a potential publisher would suddenly contact you without giving you proof of their identity or verifiable credentials of some sort. If anything, they would not be using anonymous or generic email accounts and should be able to provide you with contact information for the firm they represent, along with a legitimate phone number or web site to look them up on. 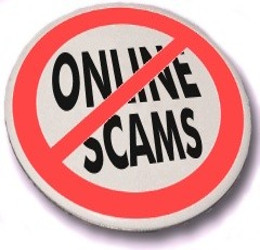 Here are a few handy resources to educate yourselves about this type of scam. As I mentioned before, it’s pretty common, particularly on sites where thousands of eager, talented authors congregate. There’s plenty of information about this type of scam out there online, and plenty of underhanded people out there to make those scams happen. If you plan to write online publicly, in any capacity, it would serve you well to educate yourselves about the potential problems you can run into when doing so. If you have any questions or concerns about this, or if you’ve been directly contacted by someone misrepresenting themselves, please feel free to contact myself or the moderators, or flag or report any accounts on the site who may be harassing or bothering you. We’ll look into matters ASAP, and we won’t hesitate to ban accounts who are determined to be participating in this kind of behaviour. This entry was posted in authors, General, Publishing and tagged agents, beware, cons, copyright, fraud, legal, misrepresentation, Publishing, scams. Bookmark the permalink. While I know what the signs of most of these scams are, it is nice to know that we have someone else watching out for us! Thanks for bringing this up to our awareness. I hate how people do such things sometimes, it can be a nerve-wracker. I hate scammers. I encountered a few on a small forum called TheOcarinaNetwork.com they proclaimed sold good Ocarina’s for cheap. Gladly no one believed them. Sadly they were successful on other websites. Oh boy! What did I miss? I’m gone for one week? well, being one of the youngst writers on the site, I’m scared. Hi @Maggie, nothing to be scared about. Just be cautious when dealing with anyone who says they’re representing a publisher and doesn’t look legit. And be sure to get your parents involved if you’re under 18! This is definitely something for writers to be aware of. In my experience, I’ve bumped into a good deal of people always looking to leach onto someone’s else’s product. I worked in film for a while, working with new filmmakers with original scripts and even my bosses, who are part of a good system, were interested in finding out how they could get their names placed on the script and omit the original author. It’s a sad sight and became a lesson I learned early on: take care of your work. You may not want to believe it but there are shady people out there who masquerade in cheap suits who say they want to help you out. There are good people–of course–who genuinely want to help, just be aware and it can’t hurt to be overly cautious.